The Imperia pasta machine : how to use it to make delicious meals in minutes. How to use the Imperia pasta machine to make delicious meals in minutes. The Imperia pasta machine is excellent but can be a bit tricky to use. 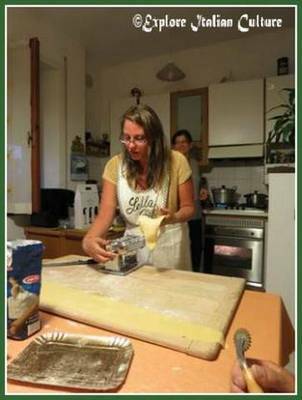 We bring you tips from our Italian friends which will have you making delicious fresh pasta without any hassle! Why have a pasta maker at all? Strictly speaking, it's not necessary. 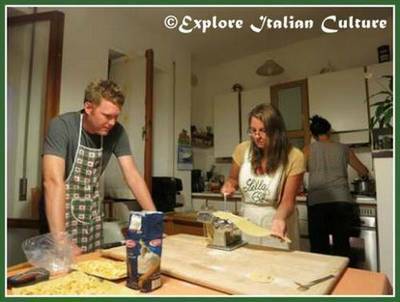 Authentic Italian pasta is made by rolling the home-made dough until it's paper-thin, shaping it into a sausage and then cutting by hand to whatever shape or size you want. 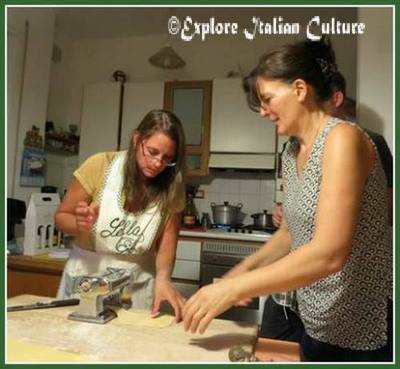 In Italy, these techniques are passed down from generation to generation - but we were lucky enough for our Italian friend Graziella to pass it onto us. These days, though, time is at a premium and not everyone is able to make fresh pasta from scratch. 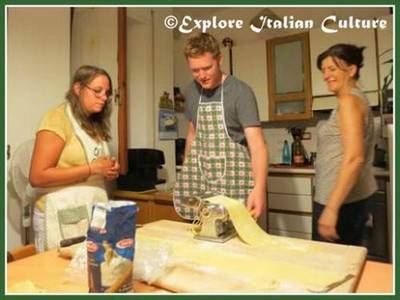 Even the most traditional families in Italy have a pasta cutter in their cupboard. The one that's the most popular by far is the Imperia pasta machine. We like it so much we have one! Because it's very well-made and simple to use. It takes the hassle out of making pasta and helps you turn your home-made dough into whatever size and shape you want, in minutes. As a bonus, it keep kids entertained too. They love watching the pasta come out of the machine as it grows longer and longer. You need to make some pasta dough. It takes minutes in the making and it's easy. 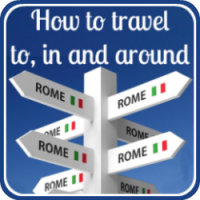 To see how our friend Graziella taught our American cousins to do it, follow this link or click on the picture above. At the point where it says "Now you're ready to roll it out" - stop and come back to this page. How to set up the Imperia pasta machine. The machine comes with an attachment to secure it to a worksurface and that's the best way to have it. It makes sure it's steady which is important as you turn the handle so that you have a free hand to deal with the pasta coming out. 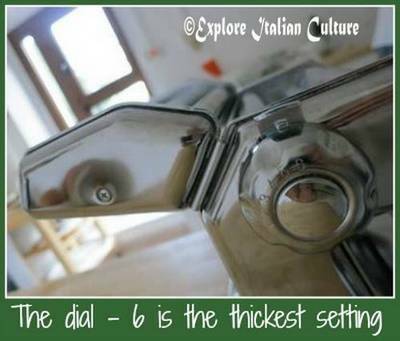 Take note of the dial on the side - this widens and narrows the rollers and the blades to allow you to adjust the thickness of your pasta and its size. The Imperia machine also has an attachment for cutting. When you start making the pasta, leave the attachment off - it's easier to handle that way - and attach it only when you get as far as the cutting stage. Take your dough and with your hands, make it into a roughly rectangular shape which will fit into the machine. 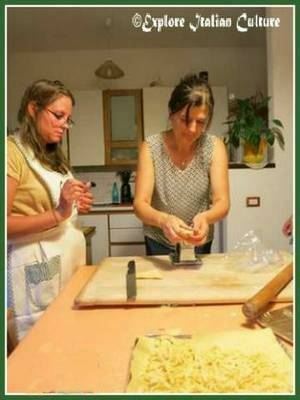 Our friend Graziella shapes the dough roughly - the machine is fixed to her pasta board. Making sure the dial on the front of the Imperia is turned to the widest opening (number 6), put the dough into the machine and turn the handle. 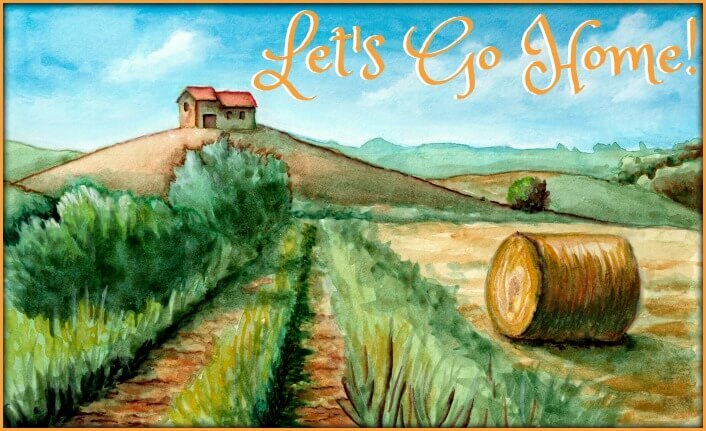 ... re-set the dial to the next setting (5), and put it through again. Each time you put it through, the dough will come out thinner and longer. Don't forget to re-set the dial each time. As it begins to grow - although it's entirely possible to manage by yourself - it helps to have two people doing this - one to put the dough through and turn the handle, the other to catch it as it comes out. 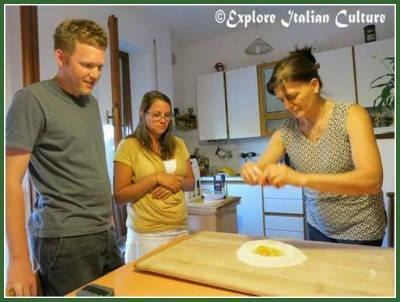 It's also more fun with two - and kids love this stage as they see the dough becoming longer and longer. Keep going until the pasta dough is as long as you want it to be - no longer than the length of the table or worksurface you're using. Lay it down on the work surface. 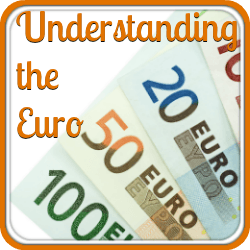 If you have another piece of dough (or more) put this through now until you have used it all. Imperia pasta machine : cutting attachment. This is the time to attach the cutting blades onto the machine. You'll find this very easy to do - they just slide on the top. Set the blades to whichever type of pasta you want using the same switch on the front. 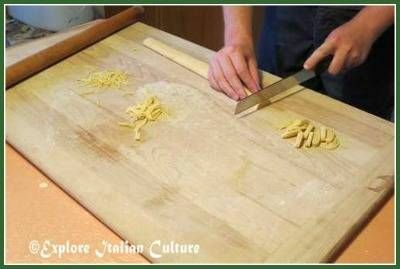 Now, take each piece of pasta and feed it through the Imperia's blades, using the handle to feed it. Again, it helps if there is someone else to help you with this stage as your dough will be very long. Have some ready prepared platters available, covered in kitchen paper and lightly floured. Once the dough is cut, separate the strips by hand and place them on the platters to dry until you're ready to cook. Some people use a 'drying rack' for this. If you're ready to cook straight away, the pasta doesn't need to be dried. 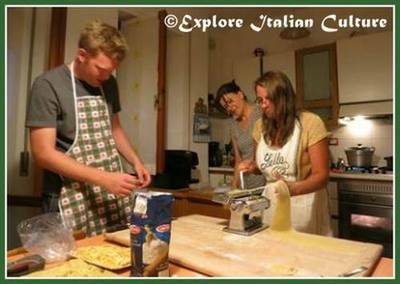 As with any home-made pasta dough, the cooking time is very short. Bring a pan of water to a rolling boil and add the pasta. 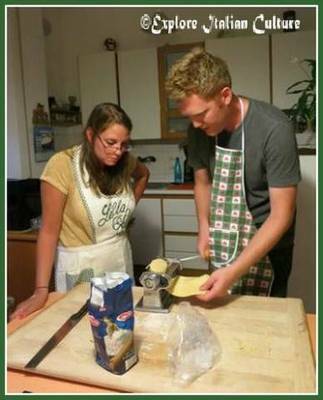 Adding salt isn't done in Italy - the taste of home-made pasta is so delicious you really don't need it. When it floats to the top - about two to three minutes - it's ready. Don't overcook it - it will turn to much! 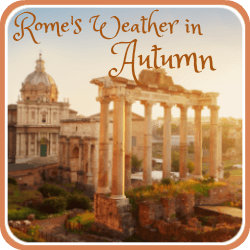 Add it to your faovurite pasta sauce, and enjoy! 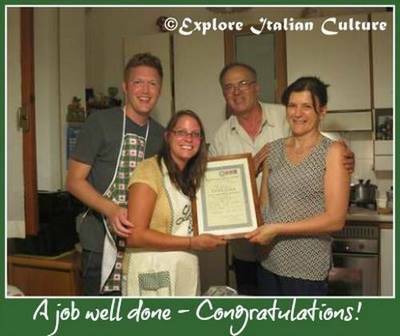 When our American cousins, Steve and Kip, learned how to make pasta from our friend Graziella, her husband Claudio was so impressed they were able to make it so well with the Imperia at their first try, that he insisted on giving them a special 'diploma' for a job well done! 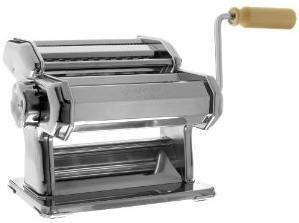 Our Imperia pasta machine review. 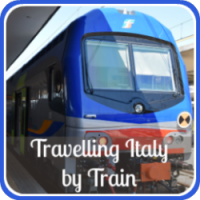 We love the Imperia and so do all our Italian friends. 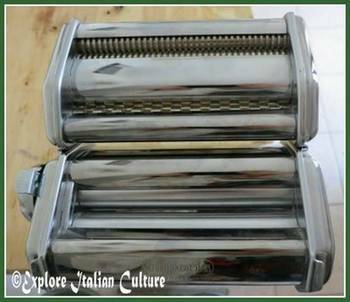 However, if you want to read more about it and what other people think, follow this link to our personal review of the Imperia pasta machine, where you'll also find the best price online if you decide to buy it. Making pasta with other machines. 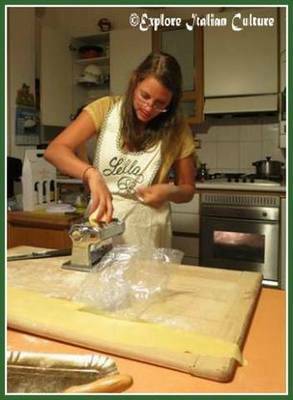 Even though the Imperia pasta machine is very easy to use, making the dough and cutting it is still time-consuming. If you just don't have the time, think about investing in a machine that does it all for you from start to finish. One of these is the 'Lello Pastamaster'. 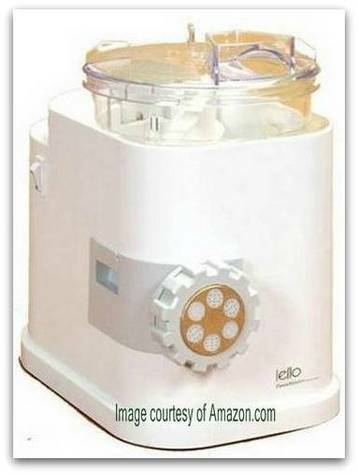 Click on the image above or on this link to see our review of one of the best machines for busy families who still want to make fresh pasta.